Kids WingTsun will help give your child the best start in life and provide with that extra edge to help them become pleasant and secure adults. In addition, children will learn safe self-defense techniques and skills that will assist them in avoiding conflicts and stand up for themselves. Children will be armed with the tools to utilise their potential to reach success in all aspects of their lives whilst remaining a good and positive citizen with strong values. All this and more is achieved in a fun and safe environment with the added benefit of cardiovascular exercise. Kids WingTsun is a concept that is much more than self-defence for children. “The greatest victory is the battle not fought”… Sun Tzu. Kids WingTsun teaches children how to avoid, prevent and / or to react appropriately in disputes. With the use of gestures, voice and facial expressions, children will learn how to assert themselves without resorting to violence.The whole point is to make children aware of all resources that are available in such a situation, beginning with a polite but affirmative demand to be left alone. In such cases, posture, voice, facial expression and gesture play a vital role to avoid further confrontation.If these measures did not help, children are taught what steps should follow and are given safe, simple, and effective methods of self-protection that really work. Such solutions are designed in a way that will allow parents to feel assured that their child has acted appropriately. In addition, children are taught simple behavioural patterns on how to deal with adult perpetrators. In such scenarios, we teach children through simulated scenarios, such as a car driver who approaches them to enter their car. WingTsun is not an extracurricular activity but rather a way of life. Our system is about a lifestyle, one that makes children better people overall – in the class and out of the class – shaping their attitude and preparing them for success in life. Part of the lessons for teaching are discussion circles where problems faced by children are discussed, as well as a few but very important rules for life. The above are just a few terms that we shall be focusing on teaching as key values to children partaking in the Kids WingTsun programme. These make up the central components of our martial arts philosophy, and in turn our character values curriculum. These values were chosen for their universal status across cultures and religions as well as their value when taught in the context of life skills lessons to children. We believe that teaching the ideals of self-improvement and self-excellence, responsibility in our actions, and being kind to others is essential for helping our children live healthy, productive lives. In addition, games with fairness rituals and monthly changing mottos, which can be also applied in the social environment help children develop a friendly and engaging character. is a healthy part of the program with exercises using Punching & Kicking Mitts. Children make judgments about their motor skill capabilities at an early age, which can affect their willingness to partake in new physical challenges the older they get. By engaging in structured and repetitive fun physical activities, children are able to better foster their coordination, flexibility, strength, balance and self-awareness. These can also greatly improve a child’s processing speed; working memory, self-control and strategic decision-making. Obtaining a healthy body through exercise is a habit that should be developed from childhood – and is something which often becomes a lifestyle when reaching adulthood. 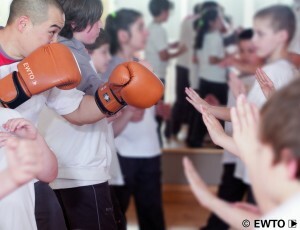 Furthermore, the EWTO provides all Kids WingTsun schools are child-friendly environments with their own cartoon mascots – Si-Je and Si-Hing. In addition, all schools use short motivational stories that are tailor-made for the relevant age groups to support the ‘Motto of the Month’ teaching concept.